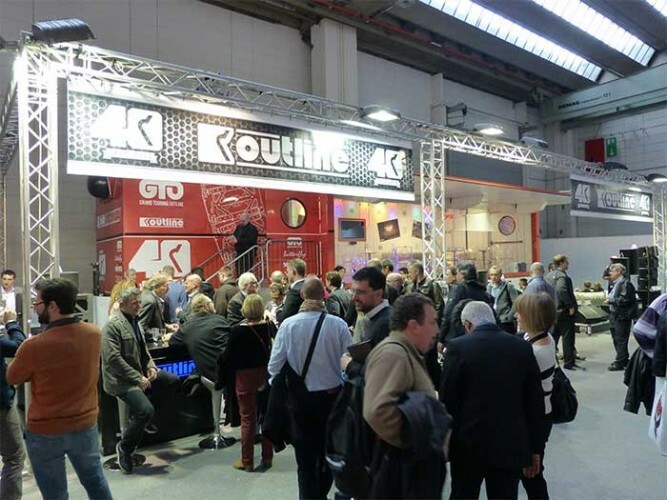 Italian pro-audio manufacturer Outline celebrated its 40th Anniversary by unveiling the all-new GTO C-12 line source array at Frankfurt Musikmesse 2013. Following the GTO concept (first introduced in 2011) of harnessing the power of multiple transducers in a compact cabinet, the new GTO C-12 contains dual high-power 12" LF drivers, four 6.5" midrange units and two 3" throat compression drivers. The footprint of the new C-12 is exactly the same as all the other modules in the GTO range, allowing full mechanical compatibility with GTO, GTO-SUB, GTO-LOW and GTO-DF in terms of rigging, flying hardware and wheelboards. Incorporating Outline’s V-Power Concept and patented DPRWG Wave Guide, and using the most advanced transducer technology available, the GTO C-12 carries the familiar high resolution signature sound synonomous with the Outline brand and family of world renowned line array products. "GTO is one of the most potent line-source systems ever produced, and everyone who works with it comments on its effortless power, clarity and definition even in the largest and most demanding applications. For many of our clients however, there are numerous applications for a system that produces an extremely high output power - surpassed only by its ‘big brother’ - but in a lighter and more compact format. That is the market demand that has driven the development of GTO C-12" - states Outline’s EMEA sales director Chris Hinds. As a reference point for existing Outline GTO owners and users, the GTO C-12 cabinet is 21.6% smaller in the vertical plane than the GTO, whereas the overall cabinet weight is down by a massive 30% - a remarkable feat of design engineering. The use of a special aluminium alloy for the integral rigging hardware, originally developed by Outline for GTO, contributes to this major weight saving. This unique system also provides twelve different adjustment settings in the angle between connected GTO C-12 cabinets, adding further to the real-world flexibility and adaptability of the loudspeaker. This concentration of power into a smaller and lighter enclosure has significant benefits in terms of transportation, storage, deployment, crew requirements and operational efficiency. GTO C-12 extends the Outline concept of ultimate system flexibility, not just because it is mechanically compatible with all the other GTO modules but also because systems of virtually any size and power can be designed using GTO C-12. From arenas to 500-seat theatres and everything in between, from maximum thunder rock ‘n roll to spoken-word performance, the remarkable capabilities of this system offer genuine commercial advantages to owners and users. Outline’s design team are developing a new lightweight flybar for GTO C-12 that will make this product a real game-changer, because using it will allow up to twelve GTO C-12 cabinets to be flown from a single 1-tonne flying point whilst staying within standard Safe Working Load restrictions. "This is big news for the many production companies that work in venues which only provide a single rigging point per side and / or have low ?ying weight limitations, because they can now bring in an easy-to-handle, compact system that is quick to rig and de-rig, which requires only one motor per side and yet produces more than enough power to handle any event" - comments Outline’s loudspeaker systems designer Francesco Simeoni. A 12-cabinet per-side GTO C-12 main L&R system with a suitable complement of subwoofers (and in?lls if necessary) will deliver the de?nitive combination of outright SPL, intelligibility and controlled coverage that makes it the perfect go-to system for thousands of medium sized venues throughout the world. Thanks to the common-voicing approach that de?nes all Outline’s touring product designs, the GTO C-12 can of course be freely deployed with GTO systems for side hangs or delays, or supplemented with other Outline products when used as a main system. GTO C-12 is fully compatible with the Outline GTO-SUB, DBS 18-2 and LAB 21 HS subwoofers. Outline can also supply suitable DSP controller presets for any combination of GTO C-12 and Outline subwoofers. 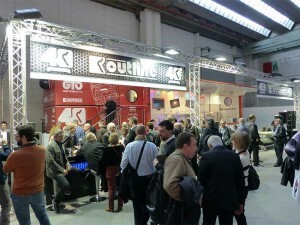 In picture: the Outline booth at Frankfurt Musikmesse 2013.